Pretzel Logic's Market Charts and Analysis: Apple, Inc. 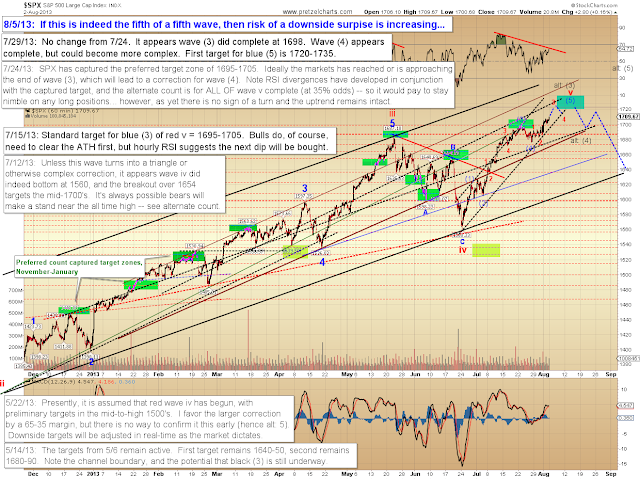 Reaches Price Targets; while SPX Bears Ask: "Are We There Yet?" Apple, Inc. Reaches Price Targets; while SPX Bears Ask: "Are We There Yet?" Since my last update, the S&P 500 (SPX) reached the next target zone of 1704-1708, the Philadelphia Bank Index (BKX) reached its target of 67-71 and Apple reached its July 8 target and July 10 target of 462-468. Today, we'll look at what may be next for all three. Let's discuss SPX first: While further upside is still anticipated, if my preferred wave count is correct then this rally is the fifth wave of a fifth wave -- meaning a significant correction (or worse) should follow. Market internals have been weakening as SPX makes new all-time-highs, which does fit the expectations of a fifth wave. The X-factor as always remains the Fed's printing press, but even the Mighty Beard of Ben Bernanke can't remain forever immune to the natural cycles of the market, and I presently see no compelling reasons to doubt the preferred wave count. All of my recent near-term upside targets have been reached; but in the bigger picture, the next target zone is 1720-1735 SPX. 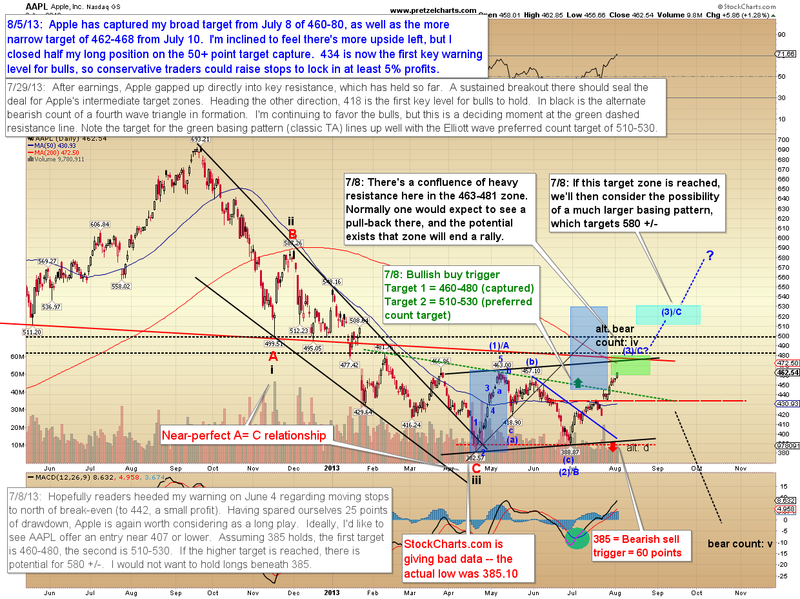 There's still a shot at my February 7 target of 1750 +/-, but we'll have to take it day-by-day heading forward, since if this is indeed the fifth and final wave of the rally, then the odds for downside risk are increasing even as price heads upwards. Personally, I've never been a big fan of fifth waves. They're designed to catch everyone off-guard -- obviously that's how they need to work, since if everyone knew the market was going to reverse its established trend in the relatively near future, then no one would take the other side of the trade. As a result, fifth waves tend to fall either a bit short of the final target (while everyone is still looking up) -- or they run right through the target and get everyone thinking all's well and the market will trend forever. We'll see how close I can get to pinning this one down, but "expect the unexpected," as the saying goes. SPX has followed the recent projections well, and presently appears pointed toward the next target zone. 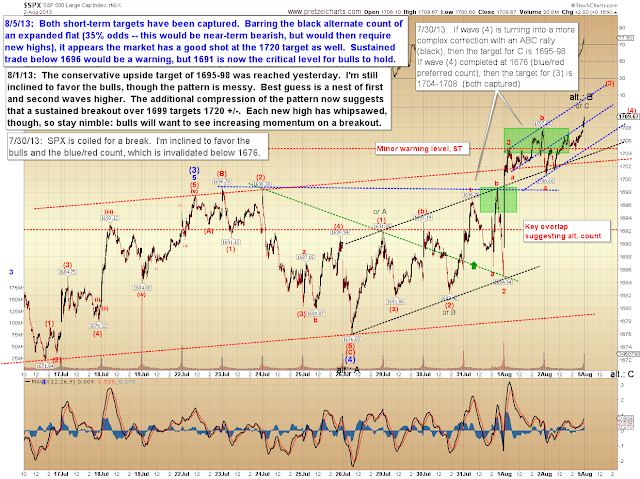 There's an alternate near-term possibility, which would add a nice twist to the path SPX takes to reach the target. The alternate count is for a pattern called an expanded flat, which would kick out the prior swing low before rallying back up to the target zone. Expanded flats are great for creating confusion and maximum pain among market participants, since the break of the prior support zone get everyone looking the wrong way. Presently, I'm discounting this alternate count at 35% odds, but the recent rally wave gives off an aura of "b-wave slop," which is why I'm discussing the potential. 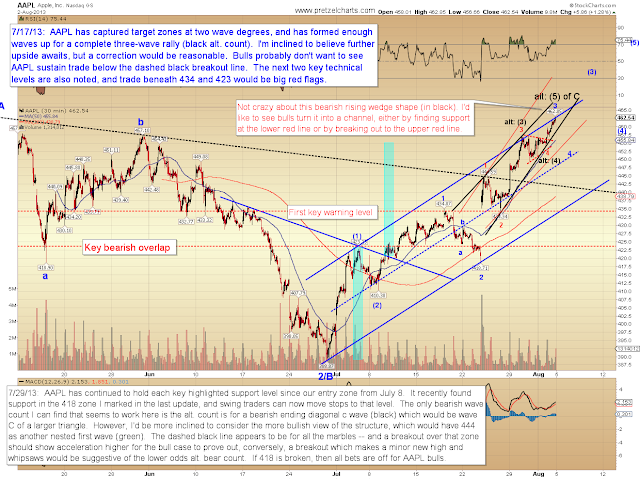 I've noted a few levels to watch on the chart below. 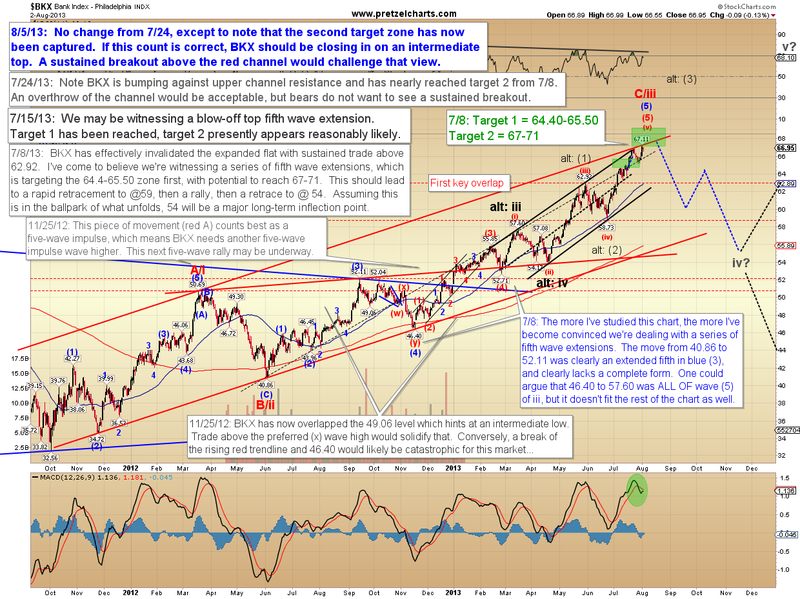 The Philadelphia Bank Index (BKX) has now reached both upside target zones. I haven't drawn a near-term chart for BKX, but it seems to suggest the same potentials as SPX. 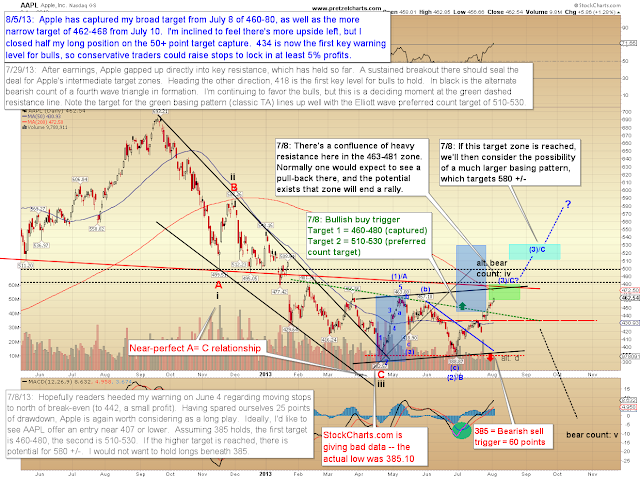 Apple (AAPL) has performed very well since I suggested it as a long play back on July 8, and is now up more than 10% since. While I still feel further upside is likely, personally I closed out half my long position at 462, and have raised stops to north of break-even on the rest. 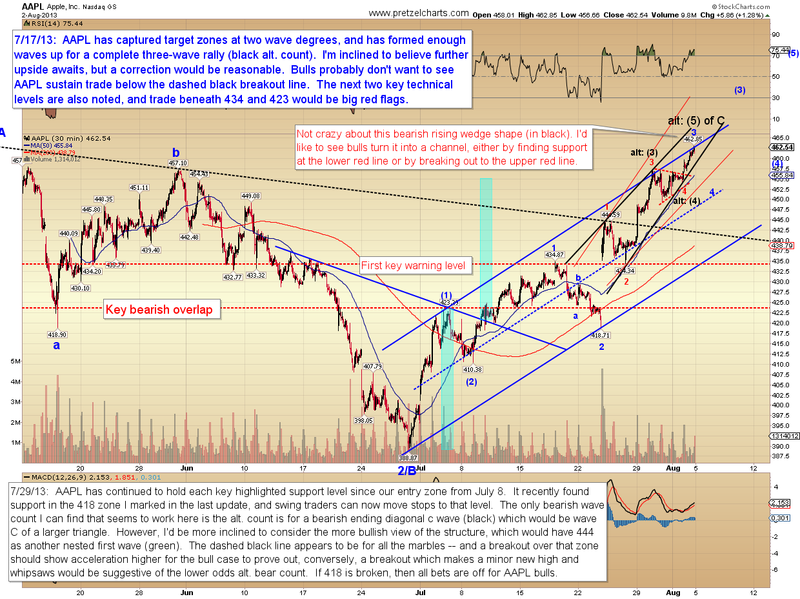 Near-term, Apple still appears to be within a third wave rally, but may be due a corrective fourth wave soon. I've noted several key levels and price zones on this chart. In conclusion, further upside still appears likely for both Apple and SPX, though SPX has left open the option for an indirect route to higher prices. In either case, I don't think we're quite "there" yet for bears, but (particularly for SPX) I believe we're getting close. Trade safe.